Neha and James lucked out with the weather this past Friday at their Engagement shoot in Long Island City, and I lucked out with photographing a fantastic couple ;) As the sun dipped down behind the midtown skyline we moved from place to place along the waterfront. 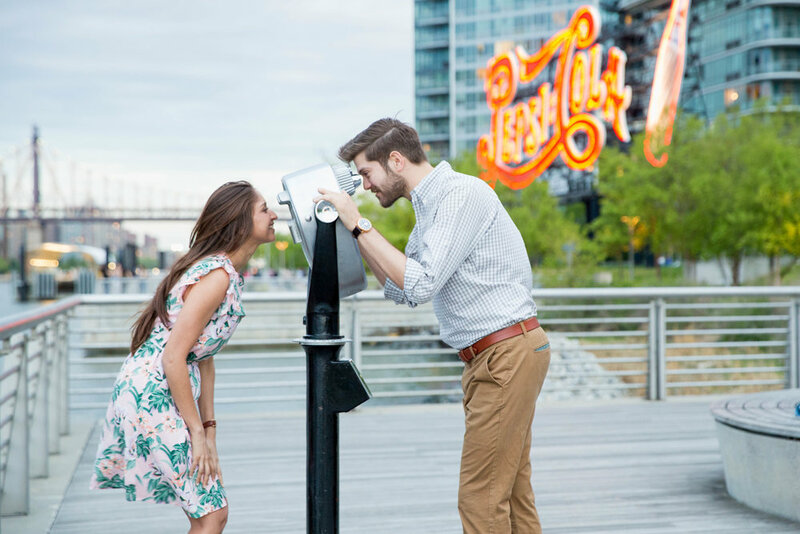 Long Island City is a super popular place for engagement shoots and its easy to see why. Below are a few of my favorites spots along the waterfront and reasons why this area is great for shooting. 1. The Light (Especially during Sunset): As the sunlight dips behind the city skyline you can get lovely sunspotted soft lighting which creates a bit of romance and is perfect for engagement photos. 2. The Willow Trees: There is section of the waterfront that has a few large willow trees that can mask the city skline in the background and if shot at the right angles you would never know you were actually in one of the largest cities in the world. 3. That Waterfront! Duh! - Especially when the sun has not fully set but is low enough that it no longer shines on the skyline and the lighting is equally perfect on the couple as it is on the background. 4. Long Island City’s back streets provide many walls simple walls to shoot your couple / subject against so that they are the focus. Unlike the backstreets of where city murals and graffiti play a role - LIC is relatively more simplistic in regards to building structures.